Samsung is looking to recapture the throne it once sat on as the top smartphone manufacturer in emerging markets. In countries like China, India and Indonesia, Sammy lost its leading position in 2014 and 2015. But a simple strategy is helping the company regain lost ground. 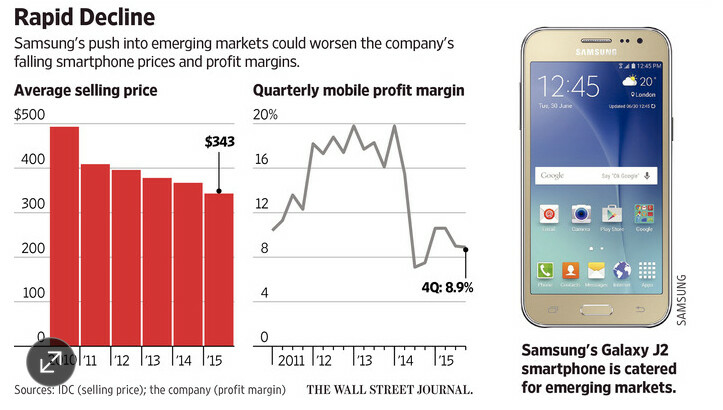 By cutting the price of its handsets, Samsung is attracting business in emerging markets like it used to. For example, the low-priced Galaxy J series gives buyers some of the features found in the manufacturer's high-end models, but is priced much lower starting at $130. However, this strategy does come at a cost. The company's profit margins are bound to take a hit from dropping its prices. As a result, Wall Street analysts say that cutting prices to be more competitive in emerging markets is not a long term answer for the company. Samsung's fourth quarter 2015 operating profits for its smartphone business plunged 60% compared to the same quarter two years ago. Samsung's gross profit margin last year was 8.9%, a far cry from the 40% gross operating profit margin achieved by Apple. It also is a big drop from the 16.1% margin Samsung earned in 2013. Samsung executives say that they can raise that figure by cutting down on production costs, and by cutting the number of different models it makes. But the company admits that cutting the price of material doesn't happen overnight. The one area it can control quicker is pricing. Samsung's phones now cost 25% more than locally produced budget phones in India, down from 40% previously. While lower prices might help Samsung become the top smartphone manufacturer in emerging markets, it will need to work on its margins or else cutting prices will be like digging its own grave. This way they not gonna take the throne back in China which is largest smartphone market of the world. Chinese brands now flooding second largest smartphone market of the world which is India. Samsung doesn't need to reinvent the wheel. As their CEO previously stated they should adapt to the new environment instead to sticking their old success in the past. And you need to go to sleep, it's way past your bed time. No Chinese mobile manufacturer could afford to buy it even if it was for sale. Hey, it's a different climate now than it was 2-3 years ago. Now its a game of numbers, ecosystem, and fancy features customers desire to keep brand awareness going to keep customers from going to competitors. Samsung knows this and that's exactly why they're improving their lower-end phones. Samsung did a lot of damage to their image with same of the lower end devices. They were infamous for having the best and worst devices on the market, it's no wonder consumers are confused and turn to Apple products. When the WSJ begins to come anywhere close to making the billions of dollars in profit per quarter that Samsung Electronics does, I will take their critique more seriously. Until then, I will call it what it is: arm-chair quarterbacking. That's like saying I can't have an opinion on the way a meal I ate tastes because I can't cook. That doesn't make any sense dude. What a load of nonsense. Why compare with a cherry picked year 2 years ago? Samsung's mobile profit margin has actually steadily been increasing. In Q4 2015 it was 14% up compared to the year before and guidance that Samsung gave us for Q1 2016 hints at another healthy increase. Talking about healthy, margins north of 30% are not healthy at all for mass volume products and certainly not sustainable for a company that offers such a wide range of products for a wide range of different types of customers. Unless you have no real competition (such as Apple within iOS). But even then I doubt it's sustainable in the longer run (see what happened to iPads). Samsung is already very efficient at making phones and getting solid volume discounts for materials: it’s not like they’re a new player at the bottom of the efficiency tables and can rapidly learn vastly better ways of doing things. Any improvements that come from them will be small but pretty much at the cutting edge of what best practice allows. J Series is a sure win for Samsung. They sell like hot cakes in my country. There are many people in my family owning a J series smartphone. Price to Performance is just awesome! J series are selling very well in their home market, Korea as well. Good affordable phone. Samsung throws everything at you to sell one of their over priced phones!! BOGO, free VR, free tv's, gear.. etc. etc. Is that the sign of a superior device when in 6 months, the value is depreciated more than 50%. one year later gazelle will give you $220 for an 6 edge..